If you have questions about how to find something in my blog, or you want something clarified, write your name etc. with your questions as a comment below. I do not publish anonymous comments--if your blogger profile does not have a picture or other information connected to it, such as, a blog link, or a profile with followers and shared information about yourself --I will not publish your comment. If there is a link in your comment it will not be published because I view it as spam. I do not like having to be so restrictive but I have found it to be necessary. I do enjoy talking to people who read my blog. The best way to talk to me is join my Facebook group called, Seeks Ghosts. Here is the link. I wanted to talk to you about maybe using an image from your site on a 'Haunted map. Do you have an email address I can contact you on? Which image? Many I use are off Wiki Commons or no longer under a copyright date--open domain etc.. Some are mine. Which one do you want to use? I just got back from San Antonio where I spent a little time visiting the Alamo... Took some pics that I didnt look at until just now. Three pictures have ghosts in them....Clearly, unmistakably. Several figures. One or two men are in a fighting stance. Smokey.. A horse we think. Other figures....... Nothing at all was there floating around when i took them. Cool! Share one with me and I will publish it on my piece about the Alamo with your name. Nice job distilling the research Bill Willard and I did on the Inez Clarke/Briggs mystery down to a few paragraphs so that readers could easily sink their teeth into it and get the important facts straight. Virginia, I am writing a book on the tidal Potomac River, and have finally gotten down to Lookout Point, where I found reference to your great research into ghosts. May I quote you and give your references in this book, to be entitled "The River That Is America?" Here is the part that notes your work: "Virginia Lamkin has a webpage dedicated to the many sounds recorded at Point Lookout and at other sites as well, and, if you want to hear 45 of the Point Lookout ghosts recorded, as ofAugust 2017, just click this web page and then on the title in the left-hand box for each: http://www.ptlookoutlighthouse.com/paranormalsounds.shtml." 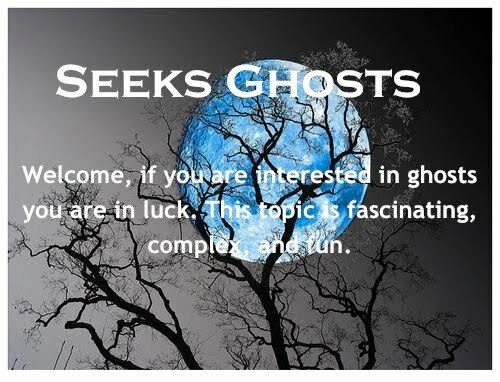 Jim put the name of my blog "Seeks Ghosts" in your cite, if you do this I give you my permission. I'm from a Japanese TV production company. Just wondering if we can use the picture of 'The Crying Boy' on your blog. What I need is the one with a capture: One version of print. We will credit your name 'Seeks Ghosts'. We love your blog and the information in it. Our experiences were recently featured on The Dead Files. We also started a blog to tell our story because we got so many questions after the show aired Our goal in sharing our story is to help others and give them the courage to come forward to get the help they need. We also put your blog on our links so that our readers can have easy access to your blog. If you would like to do the same with ours let me and I can give you the site address. I'm a staff member at The Knox Student, the student newspaper for Knox College. We're doing a video piece on the Crybaby Bridge in Monmouth and possibly an accompanying print story. I was wondering if you'd be at all available for a quick interview (no more than 15 minutes!) either over the phone or via Skype to talk about the Bridge's legend to be featured in the video/story. Regardless of your decision thank you for your informative, engaging, and helpful stories! Pace your public contact info on here so I can contact you.